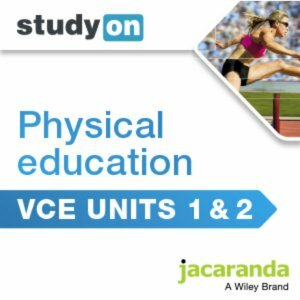 studyON VCE Physical Education Units 1 and 2 (Online Purchase) provides comprehensive coverage of the new VCAA study design for 2017-2021. It is more than a study guide, studyON is an interactive and highly visual study, revision and exam practice tool designed to maximise every student’s opportunity for exam success. Now fully integrated with all VCE texts to provide an unrivaled combination of premium resources that enable students to reach their full potential. studyON is included when purchasing Live it Up 1 eBookPLUS or Live it Up 1 print + eBookPLUS.